Pepper and I were puttering around the yard late one afternoon when we found the lifeless body of a juvenile red tailed hawk at the base of a pine tree. High above, in that very tree, was the nest. I was able to convince Pep to follow me back to the house, leaving the hawk where it lay. My husband was dispatched to take care of it. My husband and I considered the facts when he returned. The bird’s neck appeared to be broken. Had some predator gotten to it – but then abandoned its prey? Had it fallen from the nest before it could fly? The bird was no tiny fledgling. It appeared to be more of a teenager. Had its parents rejected it for some reason? I couldn’t find anything online about hawk parents breaking the necks of their own young, no matter how aggravating they might be. “It’s a terrible mystery,” I had to tell Pep, neither of us satisfied. The next day, I saw something that gave me more to think about. When Pep and I went out for our afternoon ramble, we were greeted by a loud shrieking of blue jays. They weren’t shrieking at us. Instead, two of them were harassing another juvenile red tailed hawk in the tree with the nest! The hawk perched unsteadily on a branch near its nest. The jays swooped and swiped at its head and back, and the hawk did nothing. It was already larger than the jays, but it appeared to have no idea how to defend itself or get away. I shouted and clapped to try to distract the jays, but they could have cared less. There was nothing to do except watch the jays assault the young hawk. Where were the parents?! I finally got so upset that I came back inside. Pep followed. “What’s wrong?” Pep asked kindly. “I kind-of hate nature,” I replied sadly. “Death on wings.” That Pepper has a clever way with words. I might have to use that. I kind of love your perspective on nature though. Thanks for sharing this intimate moment. We found a juvenile owl in ill health in our yard several years ago. We called the TN Wildlife Extension office as we did not wish to get too close to those talons! They sent an officer out to take it to a local vet to try to save it (unsuccessful, unfortunately). We were told that some birds of prey do not learn how to hunt well and cannot sufficiently feed themselves. Those smaller birds sure can be aggressive, though, in protecting their young. 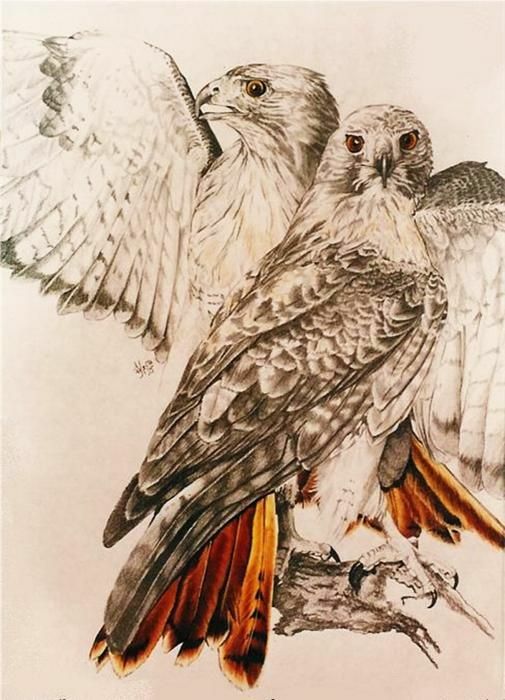 Check out Robert Penn Warren’s “Red-Tail Hawk and Pyre of Youth” from Now and Then (1977). I have watched blue jays bully other birds in my yard too. Who made them boss bird? Another wonderful story with much insight! Thank you for sharing!